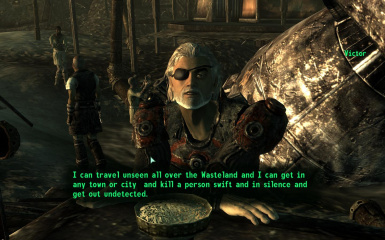 Let me introduce you Victor, a fully voiced companion with the skill of kill selected NPCs in towns or cities avoiding you to lose karma or commit a crime. 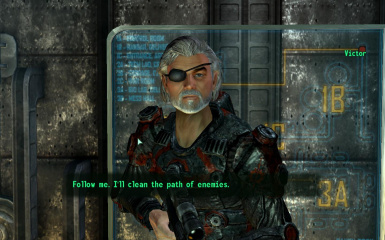 His alignment depends on your decision of save or destroy Megaton. Please, read full description for better explanation. Victor is a fully voiced companion with skills and features that no other companion will offers you. 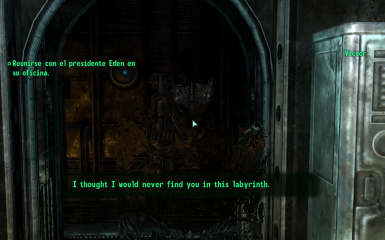 He is located in Megaton, exactly in The Brass Lantern. His alignment depends on your decision of save or destroy Megaton. He was meant to be played it in a new game to seize all his advantages. Lets read about him. 1-The main skill of Victor is to kill selected NPCs, making more easy to get items or complete some quests avoiding you to lose karma or commit a crime. If you dont have enough money or skill to convince a NPC to give you an item, or you just need to kill him or her and dont want to lose karma or get attacked by a whole city or faction for commiting a crime, Victor will make the work for you. Once he has killed the NPC, he will bring you all his(her) items. Victor's victims are not random NPCs, they are always part of some marked or unmarked quests. 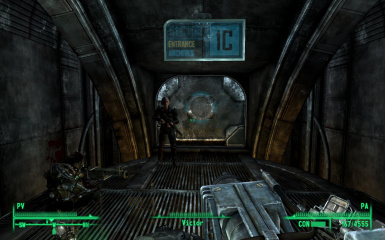 2-If you destroy Megaton while he is resting in the Brass Lantern, he will die. 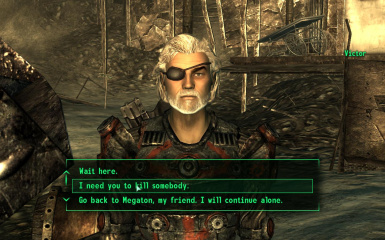 But if you destroy Megaton while he is following you or acomplishing an assignment, he will hunt you down to kill you for destroying his home. You will lose him as a follower and you will gain a new enemy. 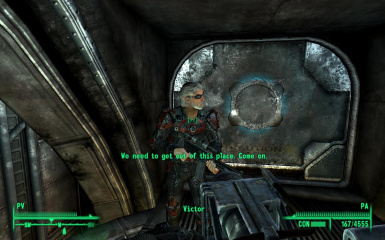 3-If you decide to disarm the bomb and save Megaton, Victor will return the favor back in a way no other companion will have done before. 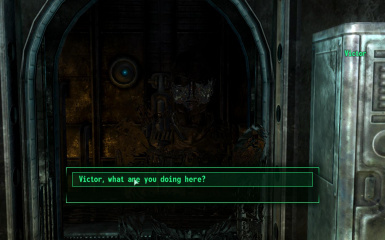 Victor will infiltrate in Raven Rock to help you when Enclave take you as a prisoner, and will accompany you all the way till you get out of Raven Rock.When he finds you in your cell in Raven Rock you will have the option of dismiss him and he will go back from where he came. 4- Victor will level with you from lvl 5 till lvl 30. He is harder than Charon, but weaker than Paladin Star Cross. But in combat he will activate a powerful shield that makes him more ressistant to damage. Once combat is over, the shield will be deactivated. He is not essential, so, if he dies you lose him forever. Hire him will cost you 1000 caps, but believe me, he worths it. 5-Once you hire him he will be permantly in your faction unless you blow Megaton. 1-You must have met or talked to the victim at least once (it is logical that you cant ask him to kill someone that you have not met before). 2-You can send him to kill a NPC far away of your current location, but, as far the NPC is located, more days will take him to go, kill the NPC and come back to you (you will receive a notification once the NPC is dead). 3-Once the victim is dead, he will bring you all the victim's items, so you wont have to travel to the victim's location. 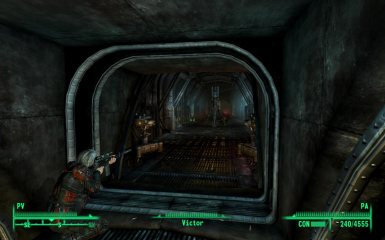 4-When you send Victor to kill someone, he will travel in stealth mod (it is logical that he kills without being seen). 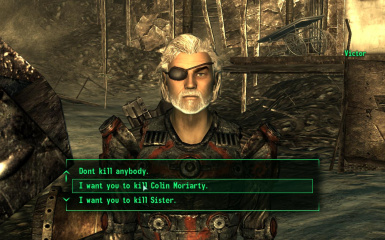 Colin Moriarty (killing him will get yo access to his computer and you wont have to pay him for information). 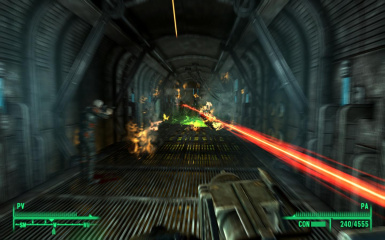 Extract the EliteAssassin.rar in your Fallout 3 data folder and check the EliteAssassin.esp in you Fallout 3 Launcher Data Files or in the FOMM. ENJOY and make your request if you like.